Lifehacker is running another "hive five" Poll that will interest GeekTonic readers. This one is "The Hive Five: Five Best DVR Applications" that includes SageTV, BeyondTV, MythTV, GB-PVR, TiVo and Windows Media Center. This is a poll LifeHacker is running based on comments made late last week of the most popular apps. Polls like this aren't the most scientific by any means, but they do tend to give us an idea of what LifeHacker readers are using for their HTPC application. Be sure and let your favorite app be known whether it is SageTV, Windows Media Center, XBMC, MythTV or another one. If I were to choose the best DVR applications listed, my favorites would be SageTV, BeyondTV and then TiVo in that order, but every single one of those five are great applications all with their own pros and cons. 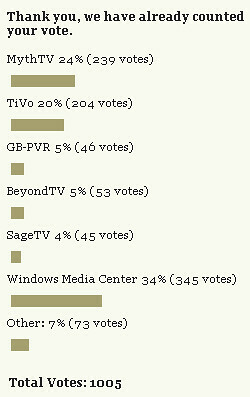 I'm expecting to see TiVo win the poll with Windows Media Center follow closely just due to the fact that TiVo and Media Center both are very well known and probably have the most users represented as Lifehacker readers.